The Dolan Technology Center (DTC) offers external customers many of the services provided to the AEP system including a wide range of real-world testing services for electrical and mechanical equipment and systems. We can provide these services at your location or at our lab located on our 23-acre campus in Groveport, Ohio. Daytime corona camera technology was the focus of a workshop held at the DTC. Sponsored by the Daytime Discharge Inspection Interest Group (DDIIG) of the Electric Power Research Institute (EPRI), the annual event allows utility professionals to discuss various aspects of corona activity. Read more at Dolan Technology Center. As a precursor to the annual corona camera technology workshop, Fabio Bologna, Electric Power Research Institute and Greg Coffey, Alabama Power, test corona cameras. Photo by Steve Wingard, Alabama Power. A series of four reactors (3 stacked in the foreground) make up the majority of the 1,300-kV mobile test set. 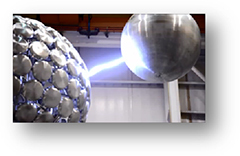 A flash at 1.3M volts is captured during testing of the mobile test bed. The Dolan Technology Center received a new 1,300-kV mobile test set. This will add to our existing 500-kV mobile test set and extend our mobile high voltage testing capabilities. This variable frequency resonant test set has a maximum output power of 3.9 MVA and is powered by its onboard generator so no external power is required. This is important where testing is required in a new substation or remote location. 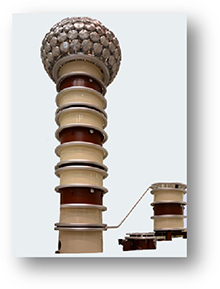 This test set will be used to commission test EHV circuit breakers before they are connected to the grid. Additional plans are to use this test set for a number of remote testing needs.